Dependence is not exactly an inviting term! Who wants to be ‘dependent’ on anything or anybody? 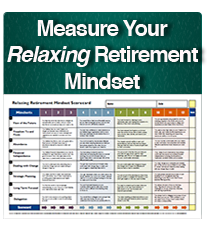 However, if you want to develop true financial INDEPENDENCE, and be in a position to make rational decisions about your future based on fact, then the first step in The Relaxing Retirement Formula™ calls for you to determine your level of Retirement Bucket™ Dependence. For round numbers sake, let’s assume that each couple has $2 million dollars in investments in their Retirement Bucket™, the same social security retirement income, and the same pensions. Jim and Sandy Independent have no mortgage or home equity line of credit, and have recently completed many of the major upgrades to their home, i.e. a new roof, vinyl siding, a new furnace, and new bathrooms. They have always lived a very modest lifestyle with little or no debt. Ron and Rose Reactionary still have $300,000 outstanding on a second mortgage they took out to pay for their kids’ college tuitions and weddings, and a condo down in Florida they bought a few years back. They both drive high end cars. And, while their home is very nice, after 26 years, it’s starting to look “tired” and could use some upgrades. The obvious difference between the two couples is the COST of their lifestyle. Ron and Rose’s lifestyle is much more expensive. The key, however, is knowing just how expensive so we can determine your level of Retirement Bucket™ Dependence. And, that’s the first step in The Relaxing Retirement Formula™ that we’re going to tackle today. How Much Does Your Lifestyle Cost? As unexciting as the task appears, the first step toward you realizing your Relaxing Retirement is for you to have a clear handle on what it costs you to live exactly the way you want! If you don’t know, I can guarantee, from 25 years of experience working hands-on with so many of you, that you will have unnecessary anxiety for the rest of your life and “pull your punches” by restricting your spending because you don’t know if you have enough. Or, you will continue to work because you think you “have” to, when in fact you may not “have” to. So, the first step toward a relaxing retirement is to have a clear handle on what it costs you to support your desired lifestyle. As I mentioned, I recognize that this may not be the most exhilarating exercise you’ve ever been through. However, it’s the key to reducing your anxiety level. Do I Now Have To Live On a Budget? Before we delve into the best way to calculate your level of Retirement Bucket™ Dependence, I want you to know that this is not about living on a “budget” and restricting your spending. This is about having an “accounting” of what it costs you to live the way you want so that you can have a measuring stick to make decisions. There are two major categories of ways that you spend your money. The first category is the typically bigger, one-time expense, like renovating your kitchen or bathroom, landscaping projects, paying for your children’s wedding (hopefully only once), or purchasing a car, etc. Think about the next five years. Is there anything you’d really like to do that would fall into this category? Write down your wish list right now, and then rank them in order of priority. You want to know right now what you’re going to need to spend money on, not five years from now when you “suddenly” need the money. Once you’ve done this, you can jump to the other category of spending; those which repeat themselves year after year. And, under this category, there are some which are “fixed” or mandatory, and some which are “discretionary” (your choice based on your priorities). Typical “fixed” expenses include utilities, insurances, groceries, clothing (at least most clothing falls under this category), mortgages, real estate taxes, etc. These are expenses that must be paid, and typically they’re paid every month. “Discretionary” spending, on the other hand, is where we’d like to spend all of our money! However, when planning, most people don’t account for them as much as they should. Things like vacations, presents for your grandkids, meals out, and entertaining, etc. Remember, this is all about living exactly the way you want, so you want to be generous with your estimates. If you guess too low, you’re only shortchanging yourself. Once you’ve identified precisely what it costs you to support the lifestyle you want, we now want to see what your spending looks like, not just today, but many years into the future. And, when we talk about the future, we have to talk about INFLATION because what costs a dollar today certainly won’t cost a dollar ten years from now. When you project your spending into the future, you have to build in a conservative inflation figure (the amount by which your expenses will go up each and every year on the same goods and services you currently purchase right now). For example, if inflation averages a mere 3%, that $200 worth of groceries you just picked up will cost you $270 in ten years! And, this only assumes a 3% inflation rate. To be more realistic and conservative in your planning, I recommend that you build in a higher inflation figure. That’s not being negative. It’s being realistic, especially in light of the massive amount of debt financing being used by our federal government. Once you have this information in your hands and you have your own unique set of numbers, you’re well on your way to enjoying a relaxing retirement where you’re not dependent on the income from work to support your lifestyle. Next week, we’re going to delve into Step 2 of The Relaxing Retirement Formula™, and determine where your income is going to come from so you can identify how much you can confidently spend. And, that’s what it’s all about. You want to be able to confidently live exactly the way you want without worrying if you’re going to run out of money. P.S. : WHO do you know who could benefit from receiving my Retirement Coach “Strategy of the Week”? Please simply provide their name and email address to us at info@TheRetirementCoach.com. Or they can subscribe at www.TheRetirementCoach.com. I appreciate the trust you place in me. Thank you!